Flying Colors singer Casey McPherson has released a lyric video fo his song My Evolution, which you can watch below. The song is taken from a new Alpha Rev album entitled Alpha Rev Presents Cas.e Sessions Vol. 1. This is a collection of songs written over the course of the last two years as part of the singer’s monthly fan-subscription service, The Cas.e Sessions. “’My Evolution’ captures a lot of what I’ve learned from Flying Colors," McPherson tells Prog. "I also ended up playing every instrument on the recording so that was a fun challenge. You won't know what you're capable of until you try! The Cas.e Sessions explores creating songs around a relevant topic or experience and documents the whole process. Every month, the members of the Cas.e Sessions get a new song, a short documentary around the song, and an online live show, which has allowed McPherson to make a record completely independent, fully funded by the members. 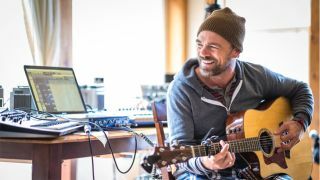 McPherson is currently working with Flying Colors on the group's third studio album. He is planning an upcoming solo progressive rock album and will continue to release albums under Alpha Rev and as a solo artist.